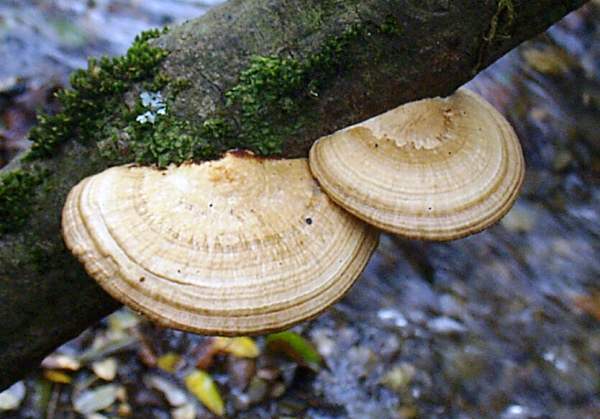 Commonly referred to as the Blushing Bracket, because there are often shades of pink or mauve in the upper surface, Daedaleopsis confragosa is a tough, slow-growing fungus. Often these distinctive brackets can be seen on riverside willows in midwinter, a time when very few other large basidiomycete fungi are in evidence. The bright brackets catch any sunlight and stand out starkly from the dark background of the branches or trunks to which they are attached. 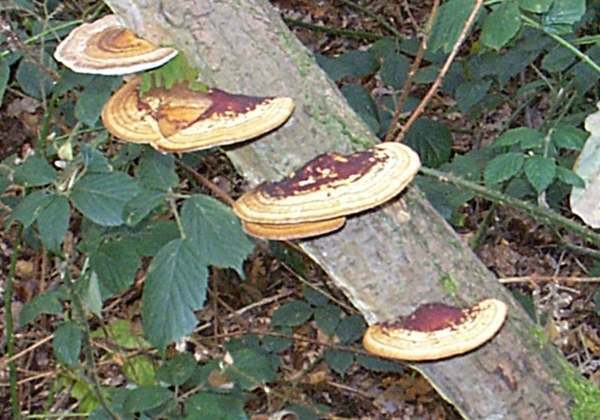 Commonly referred to as the Blushing Bracket, this tough, inedible polypore is most commonly seen in tiers (as in the example illustrated here) on dead or dying willow trunks and branches. It is less frequently seen growing on alder, and just occasionally on hazel, birch, poplar and other broadleaf trees.. In the past often referred to as the Thin-maze Polypore - even though few of its slot-like pores tend to merge to form mazes comparable with those of the Oak Polypore, Daedalea quercina - this easily-identified bracket fungus is particularly common beside rivers and streams. 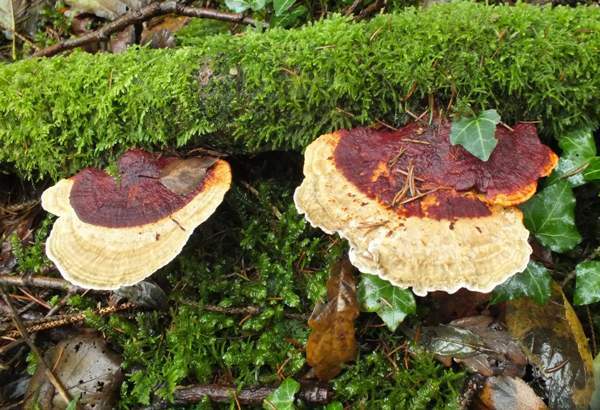 Common and widespread in Britain and Ireland and found throughout most of mainland Europe, this saprobic fungus occurs also in North America and in many other temperate regions. The very variable sizes and shapes of the pores of Daedaleopsis confragosa are evident in the example shown above. In 1791 the British mycologist James Bolton described this bracket fungus and gave it the binomial name Boletus confragosus. It was the German mycologist Joseph Schröter (1837 - 1894) who transferred this species to the genus Daedaleopsis in 1888, whereupon its scientific name became Daedaleopsis confragosa. Synonyms of Daedaleopsis confragosa include Boletus confragosus Bolton, Daedalea confragosa (Bolton) Pers., Daedalea rubescens Alb. & Schwein., Trametes rubescens (Alb. & Schwein.) Fr., Trametes confragosa (Bolton) Rabenh., Polyporus confragosus (Bolton) P. Kumm., and Daedalea intermedia Berk. 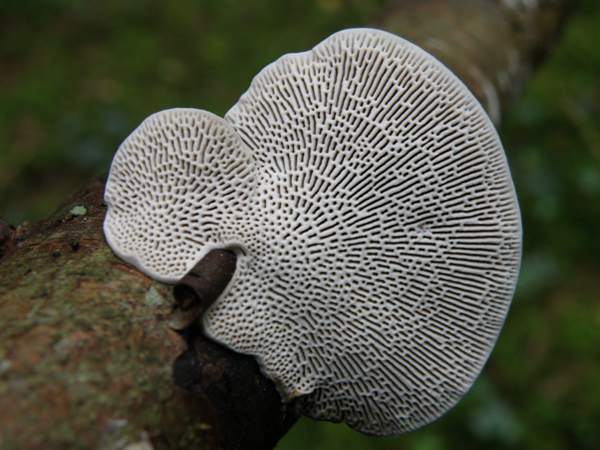 The generic name Daedaleopsis means 'having the appearance of Daedalea' (which is the genus in which you will find the Oak Polypore, Daedalea quercina; and the specific epithet confragosa means roughly corrugged and refers not to the gill-like pores but to the wrinkled and bumpy upper (infertile) surface. Usually kidney shaped, these slow-growing brackets are 5 to 20cm across and 1 to 4cm thick at maturity, but occasionally they form attractive horizontal rosettes, as seen here (left) on a fallen silver birch trunk. Blackened old fruitbodies can sometimes persist for several years. The reddish brown warts can, in some instances, completely cover the upper surface, although more often they are restricted to a central area leaving an attractive concentrically zoned outer region that is free of warts. White at first, becoming beige and ageing to grey, the underside bruises pinkish-brown when handled (as shown on the left). 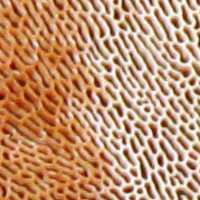 Most of the pores are closed slits, but some form maze-like patterns and, near to the attachment, some are circular or nearly so..
Cylindrical or ellipsoidal, smooth, 8-11 x 2-3µm. On dead or dying broad-leaf timber, notably willow but occasionally birch and other hardwoods. The brackets of Daedaleopsis confragosa can be seen throughout the year. Spores are released in late summer and autumn. Mazegill brackets such as Daedalea quercina are similar in general shape and colour but, unlike Daedaleopsis confragosa, their elongated pores are all in the form of a maze. Seen from above the Birch Mazegill, Lenzites betulinus, looks quite similar to the Blushing Bracket, but despite being a polypore it has true gills. Above: Sometimes Daedaleopsis confragosa 'blushes' on its upper surface!